It has been an interesting couple of weeks for video games in the Washington DC area. Just last month an exhibit opened up about the art of video games discussing the visual and historical aspects of gaming, and just this past weekend, touring show Video Games Live came to perform some music from both well known and relatively obscure titles. So how was the show? 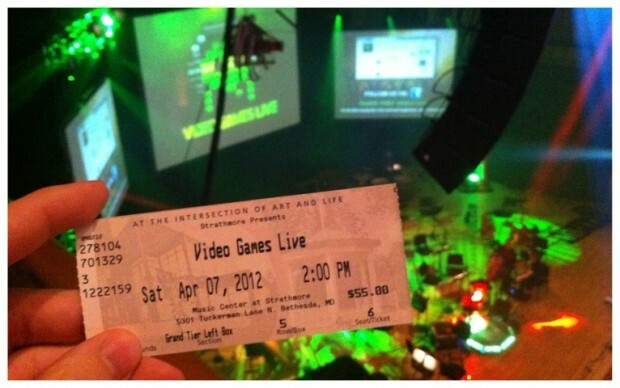 The set up of the show, as the photo might have you believe, has a standard orchestra with three large screens for the displaying of video game related things. This particular show, as we’ll discuss in a bit, had about a thirty man orchestra with a chorus for the requisite Final Fantasy wankery. Can’t talk about video game music without some Uematsu, right? RIGHT? The show proper started with a couple of video game related videos (one of which dispalyed here) and then a montage of ’80s arcade games played by the orchestra. After this, before the real meat of the concert started, there was a cosplay contest. Everyone loves cosplay contests! Among the charecters where Steve from Minecraft, the Medic from TF2, Link, and Professor Layton. The winner of the contest, however, where none of these. The winner was some child that happened to be dressed as Thor, AND IT MADE NO SENSE. He won because he was cute, and that’s a travesty to everything sacred in cosplaying. A TRAVESTY. Unfortunately, there was no program, so I cannot list all of the music that was performed in the two and half hour show, but here is a list of pieces that I can remember. Apparently, Facebook voting goes in to selecting what pieces are performed, and that led to the first big game: Shadow of the Colossus. After that, there came selections from more well known games: Mega Man, Castlevania, Tetris, Pokemon, God of War. Because this performance was in Maryland, a couple of pieces were in collaboration with the University of Maryland Gamer Symphony Orchestra, notably an operatic Tetris piece. After the intermission, a Mario medley made its appearance, as well as one from Zelda with special guest Laura “Flute Link” Intravia playing, you guessed it, the flute. It’s really great to hear Wind Waker music live, I must say. Shortly into the second half, because of the recently opened Art of Video Games at the American Art Musuem, the curator of the exhibit, Chris Melissinos, showed up to discuss the history behind the exhibit. He apparently spent some time with who is known as the creator of video games, William Higinbotham, who in 1958 made Tennis for Two, which became later known as Pong to the most of us. It turns out that Higinbotham is still totally alive at 90 years old, and during the show Tallerico and Melissinos started a live video chat with Higinbotham. They asked a few questions to Higinbotham about his role in video games, to the gleeful cheers of a nearly full auditorium. It was certainly an interesting moment. Rounding out the end of the show was two pieces from Final Fantasy: Aeris’s Theme and Liberi Fatali from FFVIII, Halo, and a Guitar Hero song that had the winner of a guitar hero competition that occurred right before the show come up on stage and play with the orchestra. The kid did really well, but he fell into the trap of standing completely still and looking like he was having absolutely zero fun. It happens to the best of us. 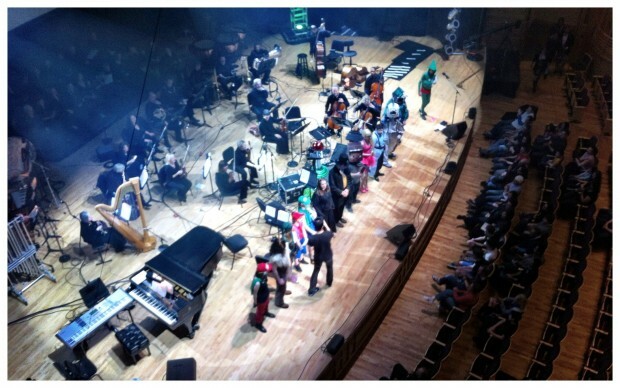 As an encore, and totally unexpected, was a medley from Chrono Trigger and Chrono Cross. Go listen to the opening of Chrono Cross and imagine how great it would be to hear that live. And finally, as a SECOND encore, the crowd pleasing Still Alive was performed. As a whole, the experience was really good. I had a great time. Only one aspect of the show felt odd at times, and that was the fact that there were recorded aspects of certain pieces that played at odds with the live performance. This mostly occurred in the percussion section, where there are a ton of vertical sounds that need very good timing. When the live audio and the recording are just a touch off, it’s very noticeable and jarring. In other instances, it simply is a shame that more interesting parts were not covered on the stage, like the xylophone in Liberi Fatali. The reason, it seems to the observer, that they have the recorded percussion is because in this performance there was one person besides a timpanist to cover all of the percussion parts, and there just are not enough hands. Had they one more person, the majority of these parts could be taken care of. I don’t know if all of the shows are like this or if they have the recorded parts on tap in case they don’t have enough people, but as a percussionist, I wanted to jump down on stage and help the poor dude running back and forth between instruments. All of that might have only been noticeable to me, I don’t know, and it should not dissuade anyone from trying to see the show if it comes to town. It was very enjoyable, and you should check it out if you get the chance.